Last week was particularly stressful for me. Making major life decisions and trying to make things happen can be exhausting and I needed to rest as much as possible. Therefore cooking and eating veggies and blogging took a back seat to vegging out. 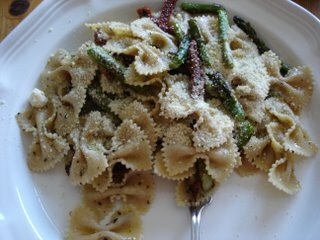 First up was a simple pasta thrown together with asparagus, sundried tomatoes, garlic and olive oil. 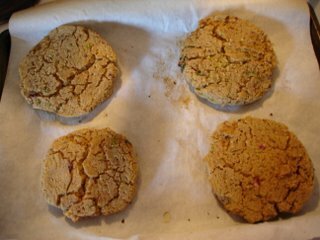 Easy and yummy. Everybody loved it. Second I made thai burgers. These were unbelievably delicious with their combination of peanuts, peanut butter, tofu and cilantro (among other ingredients) The peanut sauce that went with them was delicious as well. I made them ahead for a picnic and even though they were quite good I think they would have been much better hot off the grill (the photo would have been better too!) LOL! jess, Agreed - pasta primavera with lots of garlic is a great standby meal!